If you live in a Commonwealth country, we hope you watched the two Commonwealth Games Triathlon events yesterday. If not you missed out, both were thrilling races at the fantastic Strathclyde Country Park near Glasgow. The swims in both the men's and women's races were hotly contested with the warm conditions making wetsuits illegal, giving a distinct advantage to many of the stronger swimmers in the field. The women's swim was particularly interesting because of the two very distinct swimming styles that were on display. Lucy races on the French Grand Prix circuit where she is known as "La Sirène" or "The Mermaid" - and it's easy to see why! Swimming at around 68 strokes per minute, we calculate that she would take around 18 strokes in a 25m pool or 38 in a 50m pool. We're sure you'll agree Lucy has a very long and smooth stroke - nicely fitting the mould of the Smooth Swim Type. Notice how she likes to use her kick quite a bit, which is a trait of Smooths when racing hard. It helps push them through the very slight gap between strokes when swimming with such a long stroke style but raises their heart rate and energy consumption higher than you might expect given how relaxed they look in the water. Here we have the likes of Gold and Bronze Medallists Jodie Stimpson and Vicky Holland swimming with a lot more punch and rhythm, drafting in Lucy's and other swimmer's wakes. These are the Swingers - their strokes are not as pretty as Lucy's but are none the less very effective in open water, all that punch and rhythm ideally suited to swimming in disturbed water beside and behind other swimmers. These girls are swimming at around 85-95 strokes per minute, with a stroke length equivalent to around 23 or 50 in a 25m and 50m pool respectively. It just goes to show that there's more than one way to swim efficiently and effectively! In fact most top age group and elite triathletes swim this way (and elite open water swimmers too) - it is actually the Smooth style that is the rarity in open water swimming, not the other way around. If you watched the mens race then you'll know this to be the case as there were no Smooths at all on display, the rapid turnover of Henri Schoeman and the Brownlee Brothers powering away at 95 SPM plus, splitting the field and creating a breakaway pack of around seven Swingers, which proved to be the decisive break of the race. A few years ago we posted our classic blog Behind Every Smooth Is A Gaggle Of Bloodsucking Swingers and this is exactly what with saw with Lucy and the girls behind her. If you're a Smooth and you don't want to do all the work and drag everyone around the swim course it's worth taking a leaf out of the Swingers' book - put a little more rhythm into your stroke, regularly practise drafting in training and become comfortable sitting in the pack. You will swim the same speed but at a much lower effort, ready and fresh for the bike. Or in the case of a swimming event ready to unleash your devastating turn of speed over the last 200m to win the race! 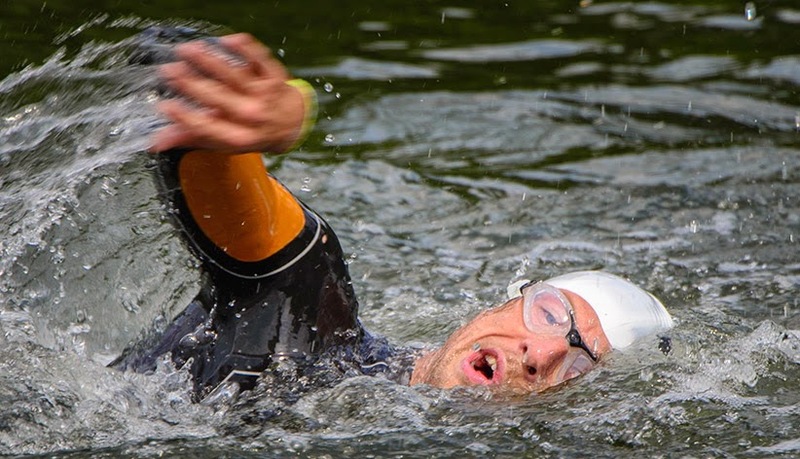 Last weekend we had the pleasure of attending the Jenson Button Trust Triathlon in Luton Hoo in the UK. If you won one of our competition places for the race it was fantastic to meet you and chat about your swimming at the event. Or if you came down for our special coached open water session on Friday night it was great working with you! We’d not seen Jenson swim before but we had a sneaky little look at his stroke during the race from one of the support boats. 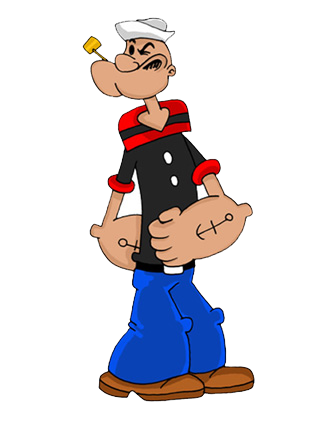 As one of those annoyingly talented sports people you might be unsurprised to learn he’s a great swimmer with a really nice stroke! Try this the next time you swim. 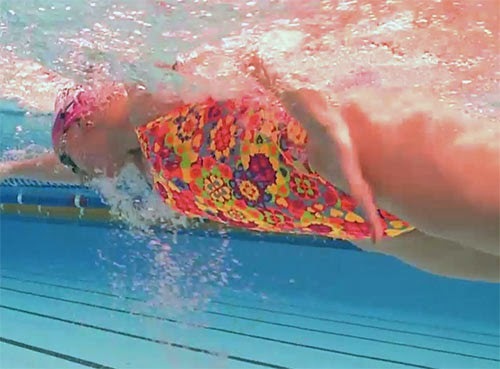 Keeping the head as low as possible as you breathe helps keep the front of your body lower in the water and brings your legs up higher, reducing your drag. Many swimmers suffer from low lying legs in the water, creating large amounts of additional drag, slowing them down hugely. If you are much faster with a pull buoy and/or a wetsuit then you know this is an issue for yourself - in fact it will be the single biggest thing holding you back. 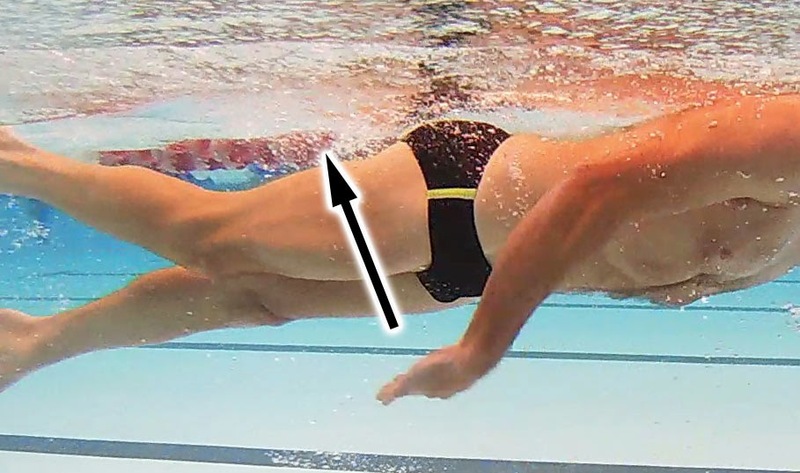 On the simplest level, propulsion in swimming is about pressing water backwards to send you forwards. Pressing up at the back of the stroke can feel quite nice because you feel quite a lot of water pressure on your palm but by pressing it upwards you are not producing any propulsion and only creating downward pressure on your legs. All by itself this can be enough to create a low lying body position. Previously on the Swim Smooth blog we have talked about using a Tempo Trainer Pro to control your swimming pace in training, both in CSS Sessions and also in (slightly scary) Red Mist Sessions. One of the great things about using beepers in this way is how accurately you can control your pace (to 0.01 second per 25m/yd!) and how you can easily make very small increases in your swimming speed week on week which add up to big gains over time. BUT - and it is a big but - what if you swim in a squad session? How can you control your pace so accurately with swimmers behind and in front, all at slightly different levels of fitness to yourself? Unfortunately there's no getting around the fact that you can't be as individually accurate with your training speeds in a squad environment but there are other advantages of squad training which more than make up for this. The upside of swimming in a squad (and it is a big upside!) is that you gain massive motivation to complete hard training sessions and measure yourself against your friends. The 9:30 squad are all smiles after their Wednesday morning CSS session! In the Swim Smooth Squads, when swimming CSS and Red Mist sessions we only give the lead swimmer in each lane the beeper. All the other swimmers stay behind that swimmer and match their swimming pace - the beeper being set for the best overall pace for the lane. 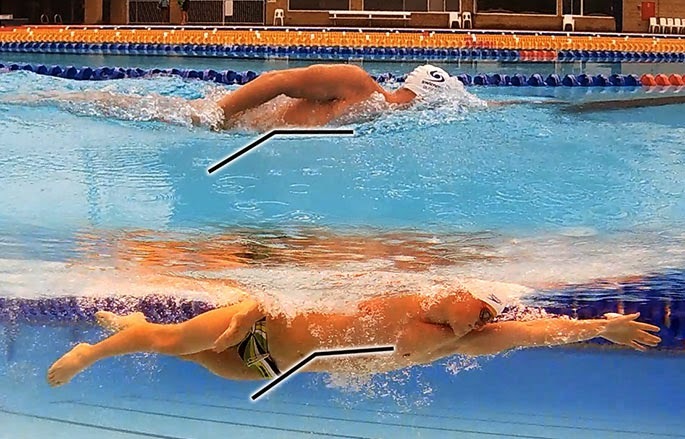 The lanes are quite well balanced in terms of swimming ability but if some of the swimmers towards the rear of the group get dropped slightly that's not a problem, they just rejoin on the next rest interval. 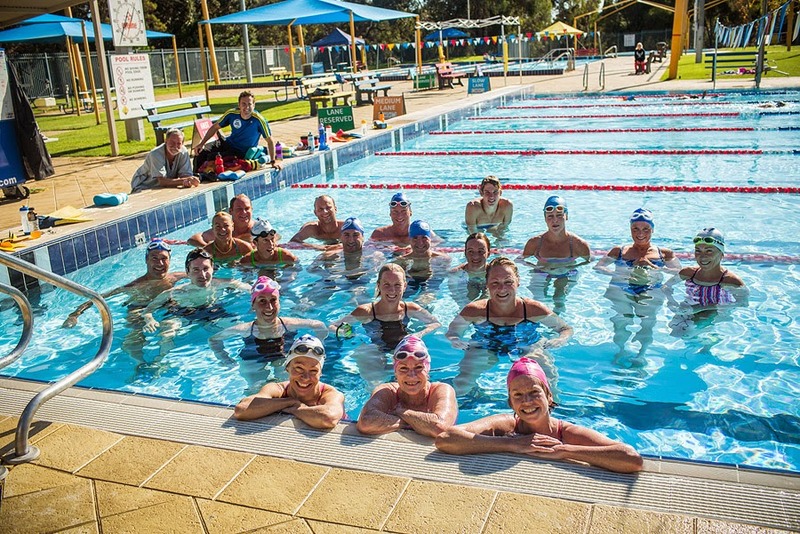 The absolute key to success when swimming these sessions in a group is to maintain the gap to the person in front and not try to catch them up. We call this: Mind The Gap! If you swam hard at the start of each swim you might well be able to catch the leader for the 5 seconds so you can sit on their feet. Don't do this! If everyone tries the same thing, the person behind you has to swim 10 seconds faster and the one behind them 15 seconds. Before you know it everyone is swimming much too hard at the start of the swim before backing off dramatically when they get onto the toes and into the draft of the swimmer in front. This is exactly what we are trying to avoid with CSS and Red Mist sessions - the name of the game is consistent pacing to develop your aerobic engine, which is what you need for distance swimming and triathlon. By repeatedly closing the gap through a set you sprint-recover-sprint-recover which might be good training for sprinting but not so good for distance swimming where you need to hold a consistent pace for a long period of time. And what if the leader fades or is having a bad session? We simply swap the leader and they pass the beeper to another swimmer. Or we might design the set to swap leaders regularly - teamwork! gap to the swimmer in front before setting off. 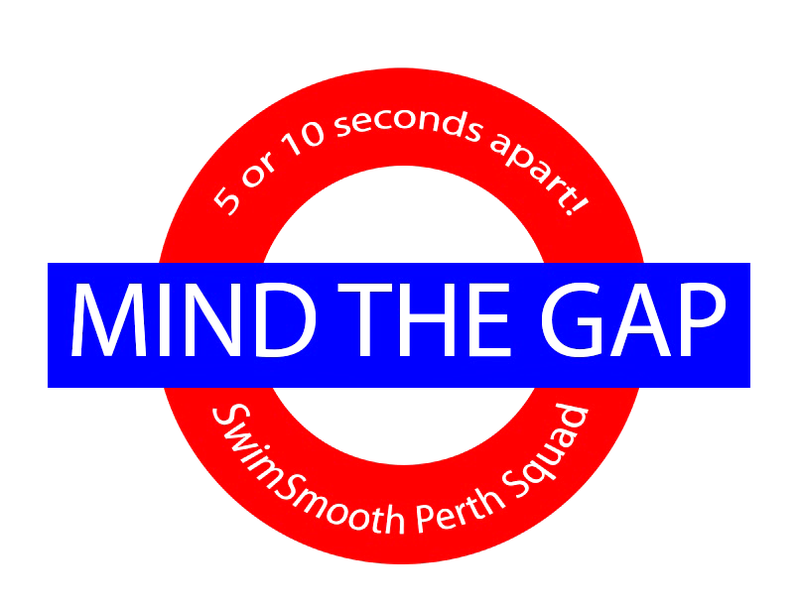 So when swimming training sets in your squad keep your discipline and Mind The Gap - closing up to the swimmer in front will only harm your own swimming, and disrupt the session for everyone else.